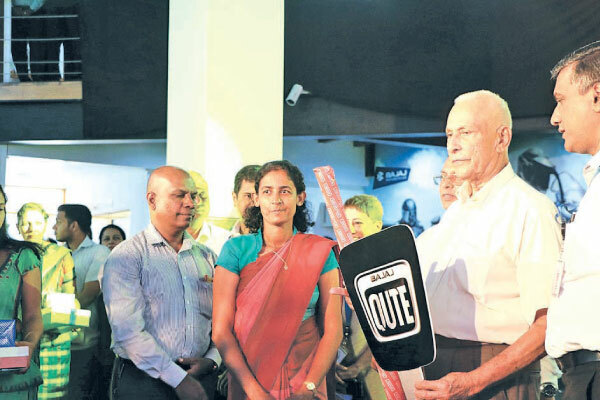 As Sri Lanka’s largest automotive company, serving the vast majority by providing affordable, economical and convenient transportation solutions, David Pieris Motor Company (Pvt) Ltd (DPMC) believes the ability to own a four-wheel vehicle, should be a possibility for all; and now with Bajaj QUTE quadricycle in the market - they finally can. The Bajaj QUTE is a Smart vehicle for a smart family. It is a quadricycle powered by World-Class patented DTSi technology. It comes with an engine capacity of 216.6 cm3 delivering 9.7 kW power at 5500 rpm and has a curb weight of less than 500Kg. It is spacious and has an enclosed body structure, giving the driver and passengers a comfortable and safer ride. Also, it has more than adequate space for luggage, runs at optimum restricted speed and its monocoque body provides safety for all. But most importantly it has 40% lower carbon emissions, conforms to BSIV emission norms and lower fuel consumption than a small car. The ‘Bajaj QUTE,’ is introduced at an attractive introductory price. Bajaj QUTE is currently being marketed in over 30 countries including Turkey, Poland, Portugal in the EU, Russia, Mexico and Colombia in North America, South Africa, African countries, Indonesia and Bangladesh.